Hanoi (VNA) - The Vietnamese Government pledges to actively participate in UN peacekeeping activities, said Deputy Defence Minister Sen. Lieut. Gen. Nguyen Chi Vinh. 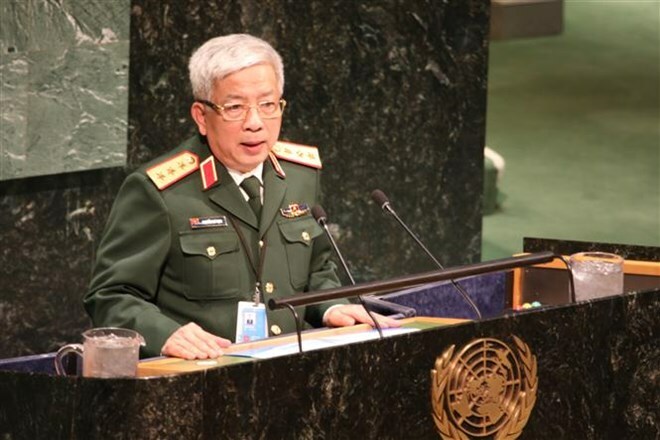 Vietnam also applauds the UN action for peacekeeping that Vietnam is a signatory, which highlights the importance of compliance with international law and peacekeeping in the world, Vinh said in his speech delivered at the 2019 United Nations Peacekeeping Ministerial Meeting at the UN headquarters in New York on March 29. Vietnam recently coordinated with the UN Development Programme (UNDP) to hold a workshop at the UN on efforts to overcome war consequences and to promote peace and sustainable development, he said, adding that this shows Vietnam’s responsibility for UN’s peacekeeping mission. The Deputy Defence Minister emphasised the country strongly supports the UN’s initiative on enhancing women’s role in UN peacekeeping activities, adding that Vietnam will send more female officers to UN peacekeeping missions in Africa in the time to come. Vietnam plans to work with UNDP to organise an international conference themed “Women with UN peacekeeping operations” late this year, aiming to honour the role of women in promoting peace and contributing to security of the world. Regarding the UN’s policy on combating sexual abuse, Vinh said all countries need to focus on improving discipline and fighting sexual abuse. He finally reaffirmed the Vietnamese Government's determination to build sustainable peace and security around the world. Vinh called for support of countries for Vietnam’s candidacy for a non-permanent seat at the UN Security Council in the 2020-2021 tenure, adding that Vietnam hopes to further contribute to peace, security and development in the world. The 2019 United Nations Peacekeeping Ministerial Meeting, which gathered more than 500 delegates from 150 countries and international organisations, discussed and generated specialised capabilities necessary for contemporary peacekeeping, with a specific focus on performance, the protection of civilians and women, peace, and security. UN Secretary General Antonio Guterres praised UN peacekeeping missions for their support for many countries around the continents, saying that the presence of ministers and deputy ministers at the conference show strong commitment of UN member states to maintaining peace in the world.